More than 80 percent of homes in the United States and Canada are equipped with dryers. The majority of those dryers utilize warm air. Every dryer that utilizes warm air must have a vent to property operate, there is a high chance that the dryer unit in your home also utilizes this mechanism. The venting system works to blow out the warm, moisture-laden air either outside or into the home. This venting may result in the buildup of hot, humid air in the room. The buildup of hot humid air may result in creating a condition that makes it hard to breath, or even hard for the dryer to perform its duties. Using your vented dryer frequently results in a buildup of lint, debris, and dirt around your vent. Eventually this buildup of dirt and debris may stretch to your home. Many vented dryers come equipped with a lint catcher near the dryer’s vent. The quantity of lint taken out after drying each batch of clothes is always very large. This amount of lint is not due to the functions of the driers, however, it is actually due to the normal wear and tear on the textile fibers that is caused due to the actual washing itself. This means that if you were to wash your clothes as you normally would, but instead of drying them in a dryer, you would instead dry them outside, then the same amount of lint would come off of your clothes as they normally would in the dryer. The main difference between drying your clothes inside and outside, when it comes to the lint, is if the lint gets trapped, which is why drying your clothes in the dryer seems like it produces more lint. It is easy to notice just how much lint comes off of the clothes after each dryer cycle once you have removed the designated lint catcher. Of course, not all of the lint, dirt, and debris gets trapped within the lint catcher. This means that some of the unwanted by-products that appear when drying your clothes escape to the vent. As with any venting system, the dirtier it gets the less efficient the product which is hooked up to it runs. This means that over time your dryer will become less efficient. It also means that if you have an indoor vent over time and dryer cycles the air you breath will become dirtier and more dangerous to breath. This is why it is important to clean your venting system with certified organic, non-toxic, cleaning products. 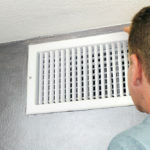 Our team at Organic Air Duct Cleaning specializes in cleaning vents of all types. We make sure to only use non-toxic, certified natural and organic cleaning products. We do this so that you can be sure you and your loved ones are breathing in only safe and clean air. This also goes a long way in ensuring that you are not constantly overpaying your energy bills. The regular inspection of ductwork is often recommended and sometimes even required in commercial settings. Some standards recommend inspecting supply ducts every 1-2 years, return ducts the same time frame, and air ducts typically need to be inspected on an annual basis. There also exist other recommendation standards which say to examine each duct system annually. There are usually some signs and indicators that it is time for you to clean out your commercial duct system. It may be necessary to clean your duct system if you need to sweep and dust furniture more than usual. Another sign may be that there is a musty or stale odor when you turn on the air conditioning.If you frequently experience headache, fatigue, sneezing, or a stuffy irritable nose then it may be time to clean out your air ducts.